Playing to a sold out crowd at Centurylink Field on Monday evening, U2 opened with “Sunday Bloody Sunday,” and then seamlessly worked their way into “New Year’s Day.” Bono’s voice sounded very clean and strong; the entire band was incredibly tight. I was surprised to hear that it was the second leg of the tour given how fresh they sounded. From the very moment U2 grabbed the stage, the crowd sang and danced to every song. This was more than a concert, it was like a 1960s social movement – one that only U2 fans would understand. 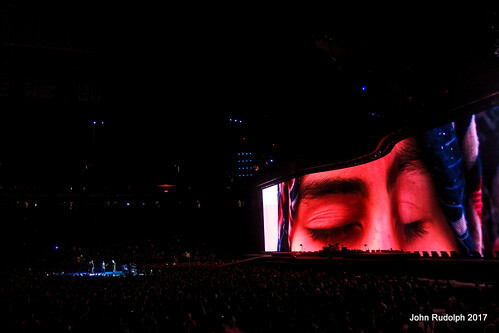 U2, known for their big visuals, delivered with this performance. A massive screen spanned the entire width of the stadium. The vastness of the screen was equaled by the dimensions of the imagery, which depicted the American Southwest and California’s Joshua Tree. It was truly amazing. The visual journey transitioned to different scenes, depending on the topic of the song. During Bono’s compliments about US involvement in AIDS research, the scenes were patriotic. U2 quickly became very political, and their target was President Trump. A scene from the TV Western Trackdown began to play, and the crowd immediately knew what it was. The character shown was named Trump, and in an episode, he was as a liar and a snake oil salesman ready to save the world from doom by building a wall. The fans cheered. U2 carefully prefaced the Trackdown usage with Americana imagery so they could not be accused of being anti-American. This was followed by two fists, with No Hate appearing on the screen. Pearl Jam’s Eddie Vedder slowly sauntered on stage with openers Mumford and Son, and they performed “Mothers of the Disappeared,” Joshua Tree‘s last track, with U2. All That You Can’t Leave Behind‘s “Beautiful Day” was the first song of the encore. During the song, Bono encouraged women of the world to rewrite history into Her Story. Bill and Melinda Gates got a special recognition for their work in the One Campaign, and he specifically thanked the American people for helping save 18 million people in the AIDS epidemic, and assisting others in a large list of global social issues, from poverty to education. In fact, the next major visual was an image of a 15-year-old Syrian girl, speaking about wanting to come to the US. A giant banner of her photo was passed around the stadium. U2’s Joshua Tree tour is a sensory explosion of WOW. Everyone could only say wow, from the time they took their seats, and through their journey home. Written by: BBS on 05/17/2017. This entry was tagged john rudolph, u2. Bookmark the permalink.